MTSU undergrads make strides w..
As fall semester quickly approaches, Middle Tennessee State University has not only been welcoming the newest crop of incoming Blue Raider freshmen but also those already in the midst of their higher ed journey who are transferring to the Murfreesboro campus this year. 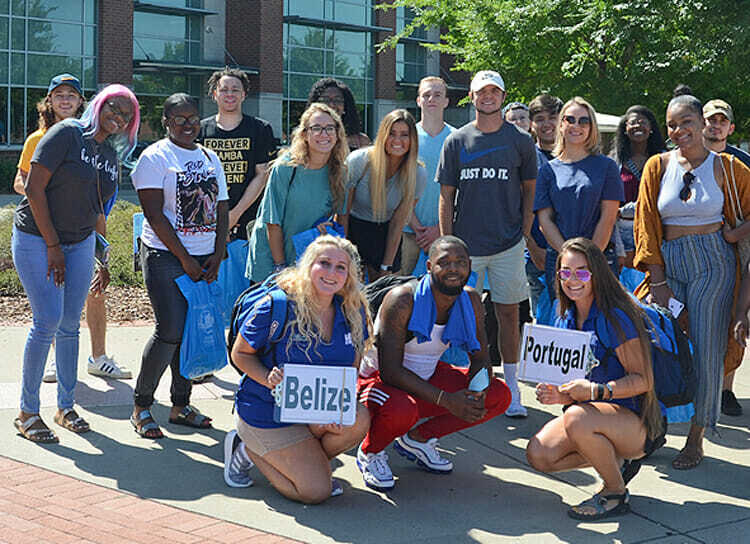 Coordinated by the Office of New Student and Family Programs, CUSTOMS helps new freshmen and new transfers learn what it’s like being an MTSU student. It helps ease the transition into the university, prepares them for educational opportunities and introduces them to the intellectual, cultural and social climate of the university. For transfer students, orientation starts as early as April and sessions are held throughout the summer, wrapping up this week. “I just feel like I’ll have more opportunities to network here,” said Diamon Williams, a transfer student from Memphis, Tennessee, while attending the final summer transfer orientation this week. Williams, who will continue pursuing his psychology major as a junior this fall, said he came to MTSU to be closer to family and has a brother who is already a Blue Raider. Transfer students started off the morning with check in at the Student Union Building before participating in various activities throughout the day such as residence hall tours, getting their Blue Raider ID’s made, getting schedules for fall semester, and a receiving a formal welcome from MTSU’s administration. Students split into different groups, accompanied by a Student Orientation Assistant, or SOA, to guide them throughout campus. “So far, people (have been) real cool and nice,” said rising junior physical education major Marcus McCulley of Nashville, Tennessee. McCulley also has a sibling who attends MTSU and even ran into someone in his CUSTOMS group that he knew from home. And just as the transfer students learned new things about campus, so do those SOAs who guide them to areas of campus they too may not be familiar with. “One thing you learn with this job is to go with the flow,” said SOA Madison Oler, a recording industry major serving as a student guide for another year. Fellow SOA Alexandria Revor, a senior exercise science major, worked CUSTOMS for the first time this year and “learned a lot about campus,” she said, bragging that being an SOA “doesn’t even feel like a job” and has helped hone her people skills. “You get people from all over with different personalities,” she said.